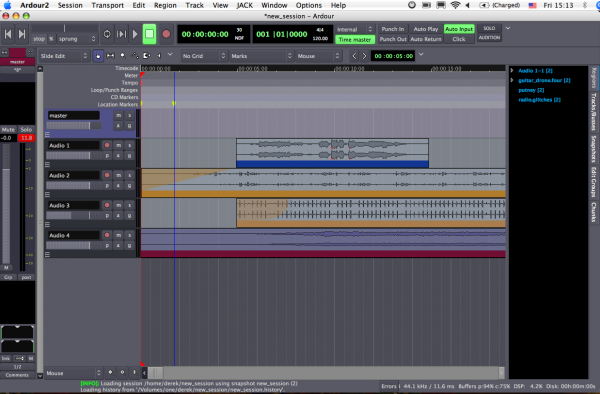 This section will give you an overview of the basic interface of Ardour, as found in the Editor Window and the Mixer Window. Later chapters will give more detailed information on each feature listed here. When you create a new session, Ardour opens an empty new window called the Editor Window. The Editor Window is the most important window in Ardour, as this is how you will control the program as well as see and edit the audio you have recorded or imported. At the top of the Editor Window are several main areas: the Transport Menu, the Clocks, the Edit Modes/Cursor Modes menu, the Snap Mode menu and the Auxiliary Controls. Below that area is the Main Canvas, which contains the Tracks and Busses used in the Session. The Mixer Strips for the Tracks appear on the left, and a set of tabs allowing for an overview of the Regions, Tracks/Busses, Snapshots, Edit Groups and Chunks appear on the right. We will introduce these controls briefly here and cover them more extensively in dedicated chapters later on. The main Clocks are located next to the transport controls. Clocks in Ardour can display time in 4 different formats: Time Code, Bars:Beats, Minutes:Seconds, and Samples. Right-click on the clock to select a format. You can also turn the clock off. Please see the Setting Up the Timeline chapter for more details on the Clocks. The Edit Modes and Cursor Modes controls define the behavior of the main canvas and the different functions the cursor can have. There are 3 Edit Modes in the drop-down menu: Slide Edit, Slice Edit, and Lock Edit. Next to the drop-down menu are the 6 Cursor Modes: Select/Move Object, Select/Move Range, Select Zoom Range, Draw Gain Automation, Stretch/Shrink Regions, and Listen to Specific Regions. These behaviors are discussed in the Working With Regions chapter. The Snap Mode menu controls the Grid, Grid Points and Edit Point. Please see the chapters on Setting Up the Meter, Using Ranges and Working With Regions for more details. The main canvas is just below the top rows of controls described above. It basically comprises the Rulers, the space where Tracks and Busses are displayed, horizontal and vertical scroll bars and a Zoom Options section at the bottom. The very bottom of Ardour's Editor Window also displays useful information, such as sample rate of the session, available recording time, DSP use, and miscellaneous error messages. Right-click on the rulers space and you will see a menu with all the possible rulers at your disposition. You may uncheck rulers that you don't need in order to save screen space. More information on these operations can be found in the Setting up the Timeline and Setting up the Meter chapters. Just below the Rulers is where Tracks and Busses are displayed. In the example below, you can see one Bus called "master" and one Track called "Audio 1". The Track Audio 1 also contains one region, which represents an audio file with a drawing of its waveform. More information on Tracks and Busses can be found in the Creating a Track or Bus chapter. At the bottom of the main canvas you can define the behavior of zooming operations. You have standard Zoom In and Zoom Out buttons, plus a third called Zoom to Session (useful for having a quick overview of your entire session: it zooms it to fit the available space on the screen). Useful shortcuts: + (the plus sign on your main keyboard) for Zoom In, and - (the dash key on your main keyboard) for Zoom Out. The drop-down menu controls the Zoom Focus. It defines the focus point of zooming operations. Try zooming in and out with + and - with a different Zoom Focus each time. For example, choosing Playhead will cause zoom to behave in relationship to the position of the Playhead. Mouse will take your current mouse position as the reference, and so on. The Editor Mixer is located at the left of the Edit Window. It displays the Mixer Strip of the currently selected Track or Bus. It controls the volume, Plugins and Routing for the Track or Bus to which it corresponds. 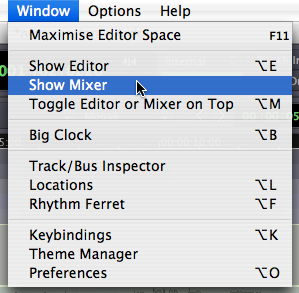 You can toggle to view or hide the Editor Mixer by clicking on the menu View > Show Editor Mixer (shortcut "Shift" + "E"). This Mixer is covered in the Using the Mixer Strip chapter. The space on the right of Ardour's Editor Window can have 5 different functions, depending on which tab is currently selected: Regions, Tracks/Busses, Snapshots, Edit Groups, and Chunks. Regions is the tab selected by default. This part of the Editor Window is commonly referred to as Regions List. Regions represent audio files stored on the hard drive which can be dragged from the Regions List directly onto a track in the main canvas. More information on Regions can be found in the Working With Regions chapter. The Tracks tab is covered in the Arranging Tracks chapter, and Snapshots are discussed in the Saving Snapshots chapter. The second window, the Mixer Window, can be viewed by going to the main menu and clicking Window > Show Mixer. The main function of the Mixer Window is to display all the Mixer Strips for the various Tracks side by side for easy reference. 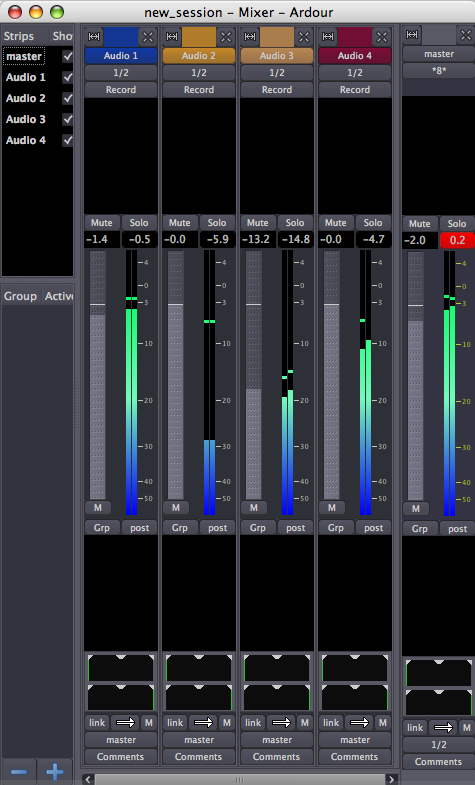 This window is mainly used during the Mixing process, and it also provides access Plugins and other Routing features. See the chapters on Understanding Routing, Mixing and Using Plugins for details. This window also contains a listing of the available Mixer Strips in the upper left hand corner. The check boxes in this area can be used to view and hide the Mixer Strips of the different Tracks. Finally, there is an area for managing Groups. You can use the key combination "Alt" + "M" ("Option"+ "M" on a Mac) in order to toggle which window is on top: Editor or Mixer. Most of the major menus in the Editor Window can be detached from the Editor Window by clicking the white, downwards pointing arrow on the far right-hand side of that menu. The detached menu will become a separate window on your screen, which can be reattached to the Editor Window by clicking the white, upwards-pointing arrow which now appears on the far right-hand side.